Based in South Buckinghamshire, we specialise in creating gardens and landscape designs that will stand the test of time, and provide year-round enjoyment. 16 Interactive, http://www.16i.co.uk/ is specified as the websites creator. 8. 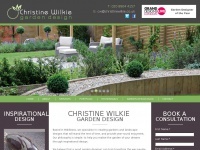 Gar­den De­sig­ner of The Year /m-garden-design-blog/show-garden-wins-grand-de­signs-..
two profiles were found for Christinewilkie.co.uk in social networks. Among other social networks the website is represented in Facebook and Twitter. The web server with the IP-address 109.228.5.117 used by Christinewilkie.co.uk is owned by Fasthosts Internet Limited - UK's largest web host and is located in Gloucester, Great Britain. This web server runs a few other websites, mostly in the english language. The websites of Christinewilkie.co.uk are hosted by a Microsoft-IIS server and were developed in the programming language ASP.NET. The content management system DotNetNuke is used. The HTML pages were created with the latest standard HTML 5. The visitor analysis software Google Analytics is used to analyze the visitors of the websites. The website does not specify details about the inclusion of its content in search engines. For this reason the content will be included by search engines.